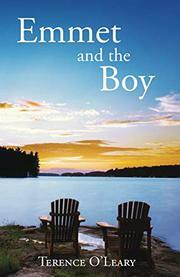 A man who recently lost his wife spends two weeks with his grandson in an idyllic Michigan lakeside setting in this novel. O’Leary (Irish Crossings: Danny’s Story, 2018, etc.) introduces readers to Emmet Hyland just before the most heartbreaking moment of his life, as cancer takes his love of 50 years, Mia. The couple’s only child, Jackie, shows up with her 13-year-old son, Colin, and Emmet barely has time to grieve when he is put in charge of the teen. Jackie and her new boyfriend are taking a vacation, and although Emmet doesn’t know his grandson very well, he feels obligated to take care of him. It’s awkward at first, as Colin keeps his head in his iPad and Emmet tries to figure out how to feed and entertain the kid. As it turns out, a little time hiking and learning to kayak on the lake is just what Colin needs to help him get over the hurt of his father leaving. And teaching Colin these things is just what Emmet requires to come to terms with Mia’s death and learn how to keep living. O’Leary’s tale is unabashedly sentimental, and it has no guile. Everything is played close to the surface, as in the scene where Emmet visits the box containing Mia’s ashes he carefully placed at the bottom of the lake: “I found my Mia nestled among the seaweed. The package was ragged. I don’t know if it was natural deterioration or if the fish were pecking away. I knew it didn’t matter to Mia. She was where she longed to be.” The metaphors are plain—Mia’s box dissolves as Emmet gains his footing and feels useful again helping Colin. The way Colin finds his confidence is fairly predictable. But in the author’s hands, these things are more comforting than cloying, and the story doesn’t overstay its welcome. This novel could have been a syrupy mess, but instead it is an affecting read. A sweet, moving family tale.